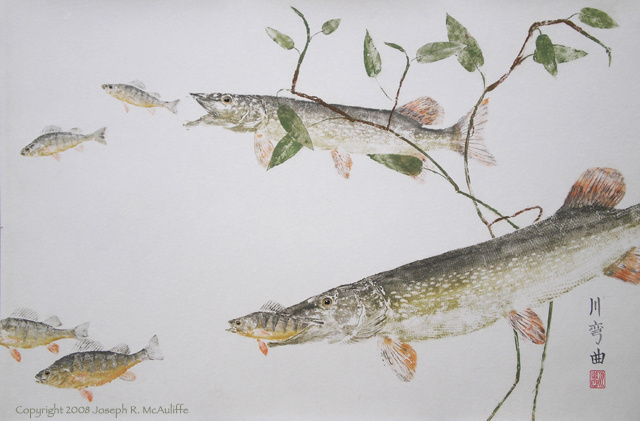 Two northern pike lunge forward to seize yellow perch that have ventured too near. 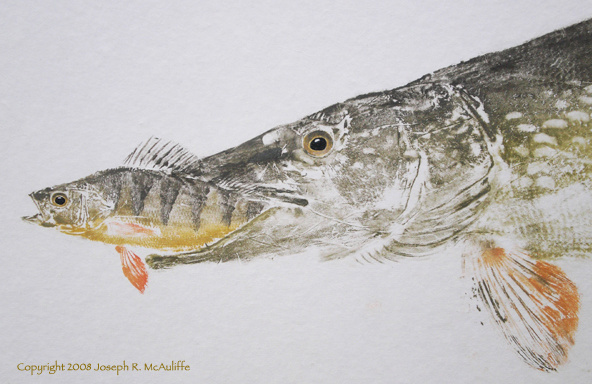 Throughout their natural range in North America, perch and pike coexist and the former provides much of the food for the latter. Perch are not the only fish eaten. Pike are predatory opportunists and will eat anything they can seize and swallow with their wide jaws filled with needle-sharp teeth. One study showed that most fish eaten by pike were at least a third the predator’s length. Given the opportunity, they are also cannibals – one can swallow another pike half its size. I have caught pike that bore multiple puncture wounds and damaged fins inflicted by a larger pike’s teeth. Anything that moves and enters the pike’s realm is potentially on the menu: swimming mice and voles, muskrats, frogs, and even ducklings and other aquatic birds. The scientific name Esox lucius fits this voracious predator. Both are derived from Greek words; Esox refers to a trout-like fish and lucius means wolf. Waterwolves they are! Northern pike are also found across Europe, including the British Isles, Russia, and northern Asia. The largest officially recorded catches in Europe weighed over 55 pounds and around five feet long; the largest American catches are somewhat less. Their ravenous predatory behavior has spawned incredible legends and stories about attacks on humans. However, not all of these stories are fiction. Human beings have on rare occasion felt the flesh-ripping bite of a large pike’s razor-sharp teeth clamped on a hand dangling in the water over the side of a small boat. Click on the thumbnail to see a larger detailed image. Purchase a Giclee print in our Online Store.